In these lessons, we will learn the Rules of Exponents and how they can be used to simplify expressions. 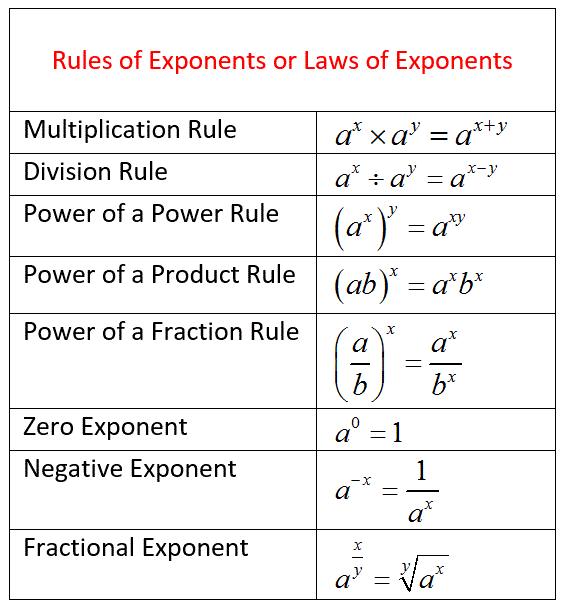 Some of the Rules of Exponents or Laws of Exponents are summarized in the following table. Scroll down the page for examples and solutions on how to use the Rules of Exponents. To multiply powers with the same base, keep the base the same and add the exponents. To divide powers with the same base, keep the base the same and subtract the exponents. When a power has an exponent, keep the base the same and multiply the exponents. We will now consider combined operations of multiplication and division on numbers in exponent form, using all the rules of exponents introduced above. 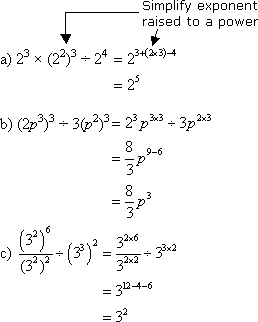 How to simplify expressions using the Product Rule of Exponents? The product rule of exponents states that to multiply exponential terms with the same base, add the exponents. Write each of the following products using a single base. Do not simplify further. How to simplify expressions using the Quotient Rule of Exponents? The quotient rule of exponents states that to divide exponential terms with the same base, subtract the exponents. How to simplify expressions using the Power Rule of Exponents? How to simplify expressions using the Power of a Product Rule of Exponents? How to simplify expressions using the Power of a Quotient Rule of Exponents? How to simplify expressions using the Quotient and Zero Exponent Rules? Simplify each expression using the zero exponent rule. Assume all variables are nonzero. How to simplify expressions using the Quotient and Negative Exponent Rules? Write each quotient using a single base. Do not simplify further. Write all answers with positive exponents. How to simplify expressions using the Product, Quotient and Zero Exponent Rules? Write each expression using a single base. Do not simplify further. Write all answers with positive exponents.